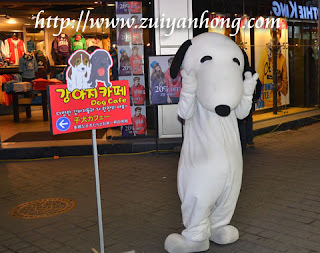 When I was strolling in Myeongdong, to my surprise I saw this white puppy. The puppy was busy posing for tourists to take photos. This friendly puppy is the live sign of a dog themed cafe in Myeongdong. The puppy was promoting for the cafe in the night street of Myeongdong. The customers of the cafe are humans not dogs. Visitors can enjoy fragrant coffee and play around with the dogs in the cafe. In case you like to keep dog as pet, you can drop by this dog cafe when you are traveling in Seoul.